Singapore is known as one of the best business hubs in the world. Its economic development has been rapidly growing – and one of the key drivers of its progress is their banking industry. Singapore’s banking sector has helped the country by means of facilitating trades, corporate financing and infrastructure building. Business Insider – an American financial and business news website – recognized Singapore as one of the 14 countries with the safest banks in the world. Moreover, 3 Singaporean Banks were also included in Global Finance magazine’s list of World’s Safest Banks in 2017. 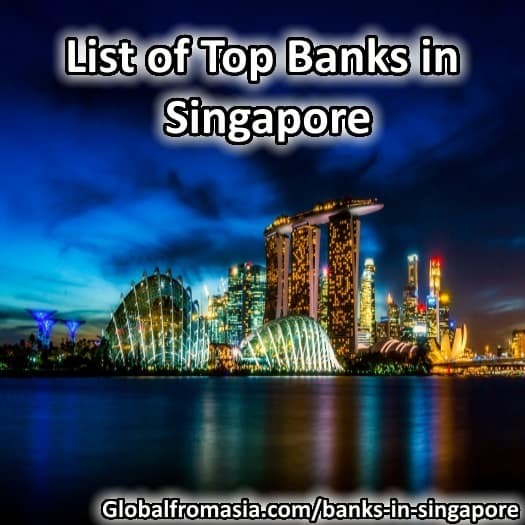 In Southeast Asia, Singapore reigned supreme when it comes to banking – DBS Bank of Singapore, OCBC Bank and United Overseas Bank are the top 3 largest bank by total assets in the subregion. Local Banks: banks that are typically locally owned/incorporated. Qualifying Full Banks: foreign banks that are able to operate up to 50 places of business in Singapore. Full Banks: banks that offer a whole range of banking business permitted under the Banking Act. Wholesale Banks: Banks that operate within the Guidelines for Operations of Wholesale Banks issued by Monetary Authority of Singapore or MAS. Merchant Banks: banks that deal with commercial/business loans, international finance. Investment, foreign trade and underwriting. Representative Offices: foreign banks that are licensed to do non-transactional operations such as marketing and investment consultation services. DBS or The Development Bank of Singapore is a leading financial service in the country that was founded in 1968. It operates and continuously expanding in Greater China, Southeast Asia and South Asia. For the past year, net profit of DBS was SGD 4.39 billion and total assets amounted to SGD 517B. Today it has more than 280 branches across 18 markets. This year, DBS is ought to open 33 more branches. Among its many awards, DBS was recognized as the largest bank in Southeast Asia, awarded “Bank of the Year” in Singapore by The Banker and listed as one of the safest bank in Asia by Global Finance from 2009 to 2017. Oversea-Chinese Banking Corporation Limited or OCBC is the longest established bank in Singapore that was founded in 1932. It has over 590 branches and representative offices in 18 countries including: Singapore, Brunei, Indonesia, Malaysia, Myanmar, Philippines, Thailand, Vietnam, China, Hongkong, Taiwan, Japan, South Korea, Australia, USA, UK, and Dubai. In 2017, OCBC reported a net profit after tax of S$4.15 billion and has a total asset of 283.7 billion as of 2016. Along with DBS, OCBC was also listed as one of the world’s safest banks by Global Finance. Moreover, it was awarded the “Best Managed Bank” and “Strongest Bank, ASEAN” by the Asian Banker. UOB is a leading bank in Asia that was founded by Datuk Wee Kheng Chiang in August 1935. The bank was formerly called as the United Chinese Bank until 1965. Today it has more than 500 branches and offices in Asia Pacific, Europe and North America. In 2017, UOB reported a net profit after tax of SGD 3.3 billion with 359 billion assets. The same year, UOB was awarded the “Best SME Bank” of the year by The Asian Banker. HSBS is a qualifying full bank in Singapore and was one of the earliest banks that was established in the country in 1877. Now, it has 12 branches and over 1000 employees under the retail banking and wealth management in Singapore. HSBC in Singapore offers a comprehensive range of banking and financial services including retail banking and wealth management; commercial, investment and private banking; insurance; forfaiting and trustee services; securities and capital markets services. SCB is a British multinational banking and financial services company that has a history of 159 years in Singapore – its first branch was opened in 1859. In October 1999, SCB were among the first international banks to receive a Qualifying Full Bank (QFB) license, an endorsement of the Group’s long-standing commitment to our business in the country. Today it has 15 branches across the country, 5 Priority Banking centres , 31 ATMs, and employs more than 9000 people in Singapore. Citibank is one the oldest banks in world that was founded in 1812 in New York City. It started its banking operations in Singapore in 1982. In October 1999, Citibank was granted the Qualifying Full Bank (QFB) license in Singapore by MAS. Today it has more than 15 branches and 181 ATM locations and employs about 1600 consumer banking employees. Citibank offers personal banking, credit cards, home loan, deposits, insurances and investment. Citibank Singapore is financially strong and well capitalized. As of 31 December 2016, Citibank Singapore has S$1.5 billion in paid up capital and a total equity of S$3.9 billion. Singapore’s population is mostly composed of foreigners, as per The National Population and Talent Division, 64% of the population of the country are foreigners. For that reason, some Singaporean banks are open to expats. Generally, to open an account, you’ll need the following requirements: valid passport, work/study visa, a proof of address, employment pass (is applicable) and an initial deposit (SGD 500 to SGD5,000) – requirements vary from one bank to another though. DBS: DBS has an Expat Programme that offers a type of account called DBS Multi-Currency Account. This account allows you to shop online, spend abroad or invest in markets at your preferred rate. It supports 12 foreign currencies and sending money to other countries such as Australia, China, Eurozone countries, Hong Kong, India, Indonesia, Malaysia, Philippines, UK and USA can take only a day and can be done anytime online. HSBC: The best thing about HSBC is that you can already open an account even before you arrive to Singapore, just make sure to do this 1-2 months prior your arrival. To do this, you only need to book an appointment at HSBC’s International Services Page or you may visit a local HSBC branch in your country. A dedicated International Account Opening Specialist shall call you and walk you through the Online Account Opening Form – this form shall be submitted to an HSBC branch near you. Account opening process can take 2-3 days, and you will be informed via email or via phonecall once the account has been successfully opened. HSBC requirements: Proof of address in your home country, Singapore work/dependent/long term visit pass or an In-principal Approval of Pass letter issued by Ministry of Manpower Singapore / a letter issued by your Employer stating your employment if applicable. UNITED OVERSEAS BANK (UOB): UOB offers non-residents a type of account called One Account, where you can easily setup an account by visiting a UOB branch and submitting these 3 requirements: Passport, Proof of Residents Address, and Employment Pass/ S Pass/ Dependent Pass. This type of account allows you to trade, transact, travel at your preferred FX rate and get competitive FX rates across 11 currencies. BANK OF AMERICA, NATIONAL ASSOCIATION MUFG BANK, LTD.
CITICORP INVESTMENT BANK (SINGAPORE) LIMITED SKANDINAVISKA ENSKILDA BANKEN S.A.
DVB GROUP MERCHANT BANK (ASIA) LTD VP BANK (SINGAPORE) LTD.